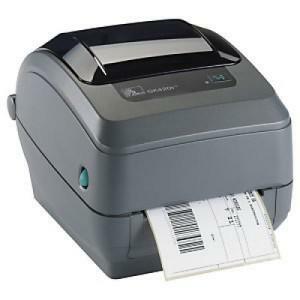 Here are the top five methods that usually work for me when working on a variety of Zebra label printers – from the GK420 and GX420 series to the bigger 110xi and M4 printers. Switch the printer off using the switch at the back near the power socket. Give it two seconds, then switch it back on. Hold down the single round button on the front panel. The indicator light will start a flash sequence: 1, 1-2, 1-2-3, and so on. When it flashes four times, release it. This resets the printer to factory defaults. See my other post for detailed information about factory resetting. Hold down the button until the light flashes five times, then release it. This will make the printer enter label width calibration. It will print a series of widths, getting wider each time, on a label. When the printed width matches the label width (or your preferred setting), tap the button once to lock it in. Here is how to factory reset a Zebra GK420t Label Printer by using using the form feed button and holding it in for 4 sequences of flashing numbers. Press and hold the Form Feed until the 4th sequence of blinks has completed. Each sequence is separated by a 1 second pause. Resets the printer to the factory default settings (equivalent to ZPL command^JUN). Some configuration settings are not returned to their initial ‘out of box’ settings. Other settings are exclusively set, viewed and controlled by programming are also reset. The performs a standard media calibration and then a memory defragmentation routine.